Just up the road from Elkmont Campground is the “Elkmont Historic district”. this old village that had been taken over by the National Park service. The intent of the Government was to let these old homes deteriorate and decay and the land eventually would be restored to nature the way it was. I returned to this area to get some photos of the old decaying buildings. To my surprise the government has decided to restore this little mountain village as a model as to what life was about here at the turn of the century. http://www.preservationnation.org/travel-and-sites/sites/southern-region/elkmont-historic-district.html My wife and I were so happy that this village will be restored and saved for our children and grandchildren to see. Any way you can see they have their job cut out for them as the homes need a lot of work. I used my tripod to get these shots one of is this one. This entry was posted on December 13, 2010 at 9:47 pm and is filed under Uncategorized. You can follow any responses to this entry through the RSS 2.0 feed. You can leave a response, or trackback from your own site. Love this…the simplicity really bring out the textures and tones perfectly! I never tire seeing photos of windows in old buildings like this. Always makes me think of my father as that was one of his favorite photographic subjects. I’m glad that this one is to be saved for future generations to see. 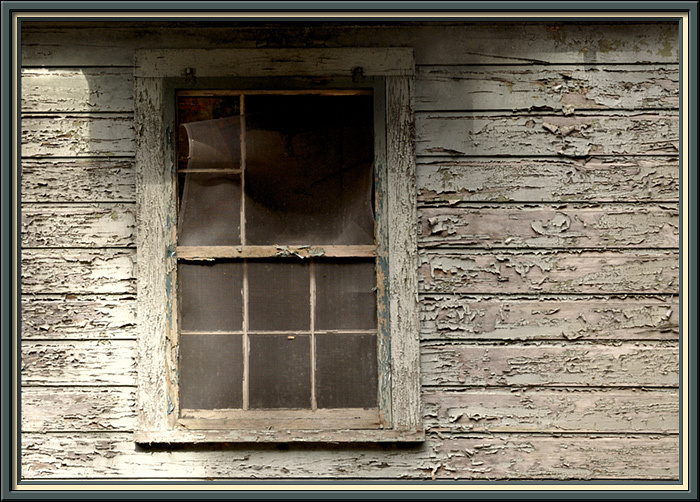 Love the simple tones and textures here and the detail in the window. Enjoyed the link, a very worthwhile restoration. Hey old fella, have you forgotten to sign up for 2011, or is it something I said???? All the best in 2011 to you and your family!